Even though it was a holiday week, there was little downtime. After such an epic June, I am motivated to make July even better! We had a home visit from a pug rescue group! Ever since Oscar went to the Rainbow Bridge, I have been hoping we could add another pug to our family. Mr PugRunner asked that we give it a little time, and at the start of the summer, he agreed that it was time to start looking. We are now approved and we are keeping an eye on the pugs who come into the rescue to see if we can find a great fit for us! Yay! After that, I was pretty much on my own until a yoga class I had scheduled for later that afternoon. The class was specifically for runners, and it was a wonderful practice, with lots of attention paid to the quads, calves and hips. It’s been a long time since I spent time in yoga, and it was so worth it. After so many busy summer days, we just took a little break on Monday. We had no obligations, and we spent the day hanging out, playing games and doing crafts. Little man also read to Molly. I think she appreciated the extra attention. My legs were like lead for this run. Maybe it was the heat, or maybe it had just been too long since my last outing. I just gritted my teeth and finished. Sometimes, that’s all you can do. Mr PugRunner and I had a little date night at a local bar & grill – it was a spontaneous thing and I was grateful that I didn’t have to cook dinner after work. I got little man for a playdate with our friends. We went to their community pool and it was so relaxing now that he is more comfortable in the water. He and his buddies wore themselves out swimming and diving and sliding, and then we met up with my parents to enjoy a yummy BBQ lunch. They took him home for the night and Mr PugRunner and I spent a chill night at home. I have been feeling a little tired, so I went to bed on the early side so I would be ok with my early morning wake up call. I don’t know how, but this run was great! I felt good, in spite of the heat and humidity. In fact, I probably could have kept going, if not for the fact that I had to go to work. I even stopped to rescue a little turtle, who was trying to cross the road and had attracted the attention of some not so friendly birds. Mr PugRunner picked up little man in the early afternoon to take him roller skating. It was his first time, and he seemed to enjoy it, although he was really intimidated by the actual rink. I get it: I don’t love roller skating. He says he wants to go back and try again, though, so that’s promising. 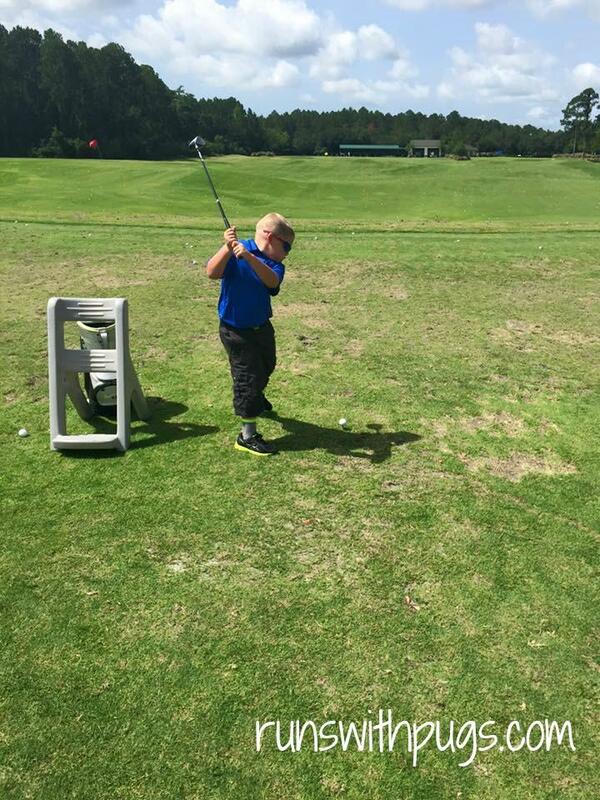 We went to a local bagel shop for breakfast and then Mr PugRunner and little man had some more father-son plans: they went to the driving range to give golf a try. I went to the store on the hunt for a pair of red running shorts for the Celebration 5K on Saturday morning, and ended up coming home with a patriotic running shirt. I set out my outfit for the next day. We had plans to meet at a restaurant at about 5:30, which was right next to our local fireworks display. We packed all our things and selected a great spot with blankets and chairs while we enjoyed our dinner. I came supplied with glow sticks and bubbles, and our little group stayed entertained until the big show. It was magnificent, as usual. After the display, we went back to the restaurant for dessert. This allowed the traffic to thin out enough for us to get straight home. Regardless, it was incredibly late when we walked in the front door – always fun for a 5:30 AM wakeup call. Needless to say, we all went right to bed! Of course, morning came too early. We all suited up and headed to the Celebration 5K. This was our first 4th of July race, and I was pretty excited about it. Mr PugRunner would be doing the mile fun run with little man, while I toughed it out in the 5K. I will recap this week, but it was a great time. I met up with a friend who is slightly newer to running and that made the miles pass much more easily. After enjoying some watermelon, we went home to shower and rest up before spending the afternoon with my parents and cousin. We were too exhausted to stay late and catch more fireworks. There were plenty going on in our neighborhood, so we watched some through the window, but I was pretty happy to call it a night. We had big plans for Sunday, too! I didn’t get in as many miles as I would have liked this week, but I am plugging away. This week, I am down for a seven mile long run, and I feel it should be manageable. Everything is going pretty well and my 1:30/:30 intervals seem to be working out for me. Obviously, it is hot and humid and we are having a lot of nasty thunderstorms, but I am navigating those challenges with good spirits. Unfortunately, I did ver little cross-training this week, so I need to sort that out. My schedule has been so very random this summer, and it makes it difficult to carve out the extra non-running time. How did you celebrate the 4th of July? Did you race? Haha Aww, the little man is so cute in his gold outfit! There is nothing better than watching fireworks over a river, it makes them look so close, high, an just cool! It’s definable much harder for me to figure out a running schedule when my life schedule is highly variable! He was a really big fan! Things will settle down when school gets back underway, I think. It’s been a big adjustment for me with going back to work and now with little man’s impending karate tournament and all the extra that goes into it. Everything is doable, but I feel like I am living in my car! Sounds like you had a lovely week! And yey for a new pug! So excited for you :). I didn’t have any races, but I got in 4 miles for the 4th! I can’t wait! No prospects from the rescue quite yet, but I know the right dog will come along. Four miles on the fourth is perfect! Another fabulous week! 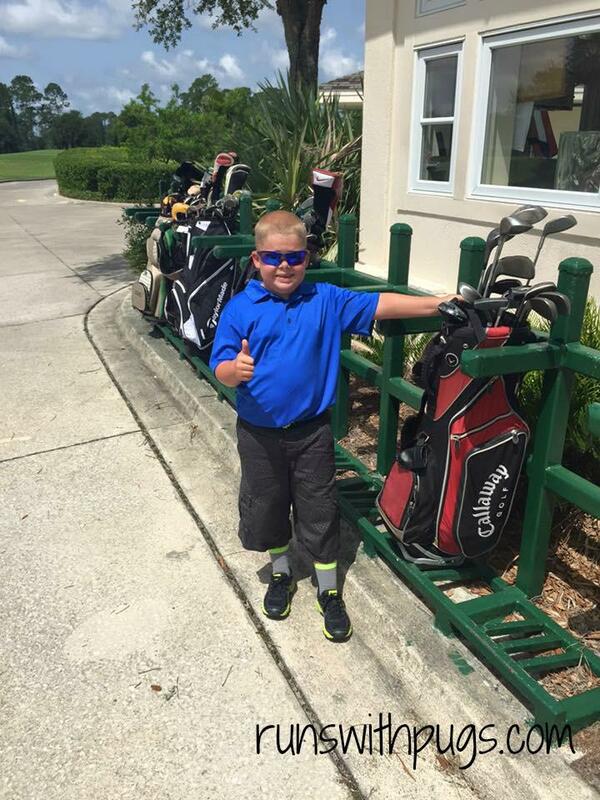 Sounds like Little Man and Mr Pugrunner have been having tons of father/son fun! So important. And LM reading to Molly?! I died a little. So cute! Congrats on the great runs! Especially the race! I had to skip my planned Four on the 4th race. I had been taking Benadryl for DAYS for some hornet stings (one on my eyelid!) and knew I couldn’t push out four incredibly hilly miles in my Benadryl induced semi-coma. Well… maybe I could have, but it wouldn’t have been pretty. And I had to do the barn chores and what not too. Sometimes we have to listen to the body. Mr PugRunner has been really busy with work lately, so I’m glad they have had some quality one-on-one time. Molly loves all the attention. Because of course, all attention belongs to her. Hornet stings on your eyelid!!!! Nope! I hope you are feeling better! 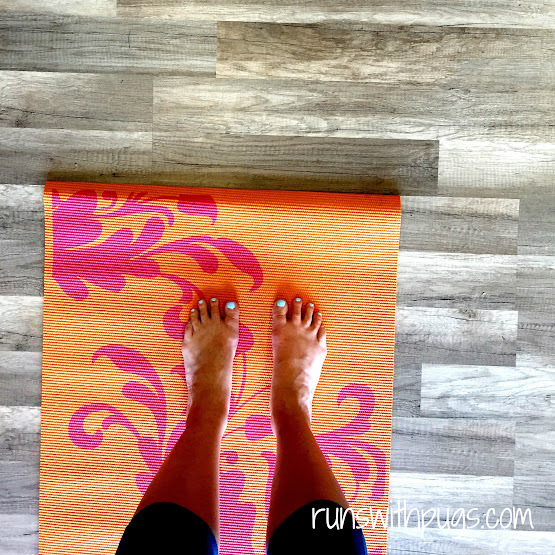 Love the yoga class for runners! p.s. every monday at 4pm est I co-host a twitter chat about a common #fitmyth! Next week is about running and fleet feet is sponsoring! you might enjoy it! Thanks for the FYI! I will see if I can make it! Your race outfit was perfect for the 4th. So cute! I really liked it! I wish I had gone ahead and ordered a sparkle skirt, but there’s always next year! This was my first 4th of July race too and it made the day so fun. I am heading over to read your recap! I hope you had an amazing weekend! Sounds like a fun week! Cool that your parents got to spend some time with your little guy. Little man loves his grandparents and vice versa. I’m glad that they get to share so much time together. I’ll be there in a couple of months. Fingers crossed that I’m prepared! Oh! I will check it out! Thanks! You guys are always doing so many great family things! I love your racing outfit. It’s very fun & patriotic without being something you can’t wear any day of the week. We do try to have fun. 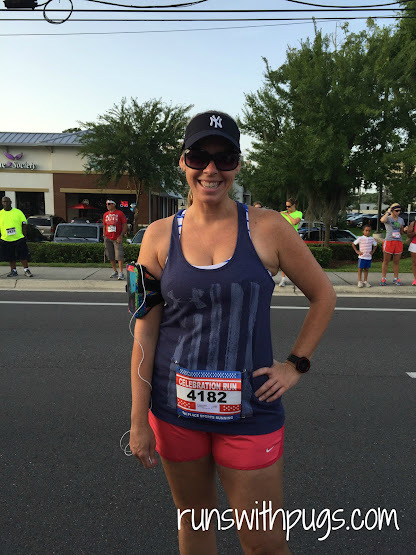 Sometimes, our schedules get a little full, but it’s ok.
Love the patriotic running top. I hate those runs where your legs feel like lead. They are frustrating, but I tell myself they make me stronger. I am glad you had a fun holiday! True story! And I am so glad we got to meet, even if it was just for a second! It was nice to see you at a race!